The Chelsea fire rated door is a contemporary design to suit to any home, the door benefits from flat panel detail and a flush contemporary moulding. The Chelsea mould is always a popular choice, and blends well to match any new interior. The contemporary mouldings give a subtle yet stunning look. These moulds suit any space and also are popular choice when replacing bespoke size doors. Every made to measure internal fire door is made from the finest fire resistant materials, we create more than just a beautiful door. The high density engineered board used in the range creates the highest quality fire rated doors that offers 30 minute fire protection. Our team will work to design and create the perfect custom fire door to strict fire regulations. The 6 panel made to measure door model is a classic design, and is popular throughout the United Kingdom. The tabs below hold more information on the build, finish and delivery of the door. At Trunk we are proud to offer designer bespoke doors, without the hefty price tag. Every handcrafted door is different, at Trunk we understand that finding the right size is important, That’s why we offer a completely bespoke service. This unique service allows the team to put the care and time into every door to meet and exceed customers expectations. All interior doors and interior fire doors are 44mm thick. 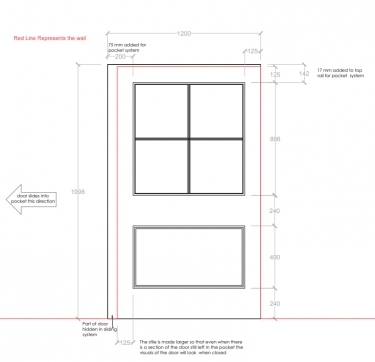 Our standard door sizes allow us to make any door up to 2100mm with a width of 900mm. We can also make oversized doors, but the price will vary accordingly. We can offer doors that fit every odd shaped size. While we can make almost every door imaginable, we are limited to the height of 2.8 meters. If you have a query about your size the Trunk team are a phonecall or email away. Each bespoke door is primed in antique white, This allows the finishing touches and colours of the door to be selected by you. 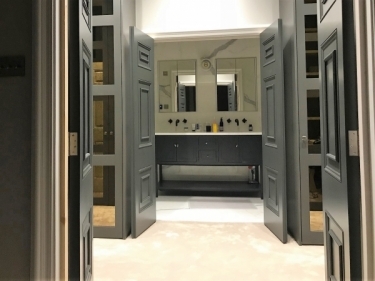 As the nature of the product is completely bespoke we refrain from applying the final finishes to the doors due to little fixes that may occur in the fitting process. For more information, tips and tricks for finishing your door, we recommend visiting our “how to finish your door” guide. With a vast amount of choice it can be overwhelming to choose door furniture, with variants in colour, finishes, style and shape it can be hard to make the right choice to complement a made to measure door. 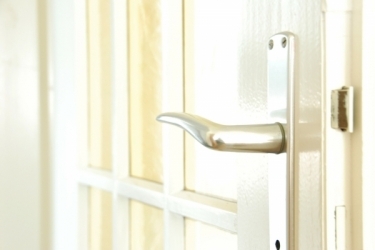 Let Trunk doors, we have the ability to source door handles, locks and much more at keen prices and we are happy to help supply you with matching door furniture. To ask one of our team about finding the perfect accessories please press the enquire button below. Trunk door’s will deliver your made to measure door anywhere in the United Kingdom and Ireland. As every bespoke door Trunk makes is different, the price of delivery can vary upon the size and quantity of the order. We recommend getting in touch with a member of the Trunk team so we can advise you on an estimated delivery cost prior to purchase of any made to measure door. Delivery prices may vary, in this situation Trunk Doors will contact you before processing your order, alternatively you can contact us to verify delivery prices. At Trunk doors we have an innovative solution to manufacturing fire safety doors. Every fire door we make is made from high density particle board, with a hard wood veneer. We create more than just a beautiful door, the high density board used in the range creates the highest quality fire rated doors. Rated at either FD30 or FD60, depending on the door thickness chosen, our 44mm doors are rated FD30 which are 30 minute fire doors and our 54mm door are rated FD60, these are 60 minute fire doors. With our passion for design and elegance the perfect fire door can be made to your measurements and to suit your home. We will also supply all fire safety paper work for the door and any glass included in the door.